Though Sachin Khedekar has been around in television for more than 15 years, in terms of visibility he is just five years old. Imtihaan was his first television serial. And his latest project is the big screen film Astitva by Mahesh Manjerekar in which he plays a negative character. He chose it because the story was meaty and Mahesh is a fabulous director. According to him, he 'arrived' with the teleserial Sailaab. His ultimate ambition is to do a Broadway musical. Because as a theatre man it is the only medium that truly excites him. The man loves acting. So much so that even in school his only hobby was acting. And Marathi plays were the passion. In fact in school they had their own group which organized cultural programmes. He began his stint in theatre with well known actor-director Vinay Apte and then moved on to television so he could expand his horizons. Born in Mumbai's Vile Parle, he comes from an orthodox middle class family. He is an environment engineer and has two years of consultancy behind him. Very much the family man, he has been married six years and has a three-year-old son whom he loves to drop to school. Khedekar's trademark moustache marks him out. He also happens to be a self-confessed misfit among the 'in' crowd. The ever-modest Sachin Khedekar gets into talk mode with Nupur Rekhy. You are known for your sensitive portrayal of roles. Is there a special method behind it? I was never professionally trained. I have learnt with practice. Whenever I have to act in a scene I remember how I used to approach that particular emotion in real life. The attitude of the character just flows in me. I just react to space and actors around me. Let's just say there is no special method behind it. I have just improved with time. I do not believe in the myth of living in a role and in people who claim they are born or instinctive actors. I believe acting is an art form and it evolves. Is there some special effort that you have put in to improve your acting ability? Yes I have worked hard on my Hindi. I used to read newspapers loudly. Are you an actor by choice? I have no moral obligations to anyone or anything so I am very selfish and I act just for myself. One gets the feeling that you think that television has an upper hand over films as a medium. Is that true? It is a known fact that television has better actors, directors, and writers in number. And television is bigger in terms of reach. The story structure is bigger and there is huge variety. All these are lacking in Hindi cinema. How do you get over the monotony of acting? I do get bored at times when there is a lack of variety in roles so I always seek variety. To get inspiration I go back to theatre and do a rigorous 30 days of practice. But I don't have the problem of living the character. I just switch on and off when I want. It has never happened that the borrowed character has personally effected me. Nerves do tighten at the end of the day when I have played some very emotional roles. Sometimes it also drains me emotionally but I just meet friends, producers, talk about films, deviate the topic towards food and always try to meet successful people. So that I always have the inspiration to work harder and strive for more. How do you prepare yourself before a shoot? Basically I try and 'cook' out the traits of the character and I do wish that I could get the script before hand but it never happens so I just ask assistants to give me an idea about the characters. When I have to act out very emotional scenes, it depends on my emotional memory, which triggers and influences that scene. Basically my preparation is always my personal experience. Plus the impression of the people around me and the director's guidance. And I have a lot of sensitivity to my co-actors and that helps me a lot. Who are your favourite actors and directors? In theatre I like Dr (Shreeram) Lagoo, Satish Shah and Pankaj Kapur as actors and I admire Amitabh Bachchan and Naseeruddin Shah. What is your emotional state on a set. Are you nervous? I am not nervous but I am restless (I shake a leg all the time till the director says action,) and yes there is high anxiety and nerves are tightened before a shot. And I always feel that since there are such a number of ways to say my lines so I just wonder how should I say it. Given a choice between theatre, television and films, which is your favorite medium? I like all of the three but theatre is the one that truly excites me. Theatre is the only ground for an actor to prepare. The process of rehearsal is the most important for theatre. It goes on for 30 days. And after that hard work the audience response plays on the character. Why did you choose the silver screen finally? For exposure to a different medium and to a different audience. Every actor wishes for more and more people to watch him and I am no exception. Every activity has a different type of audience and you want to relate to all kinds of audience. It's a thirst to see different audiences watching you. And naturally money is important. It shocks me and it makes me feel I am not up to the mark and that makes me work harder. Is there anything in your life that you really want to do but have not been able to yet? I want to do a Broadway musical. In fact I would love doing anything that would allow me to travel around the world. I would love to play the character of Hamlet but there would be so much rehearsals involved that I am sure I would not be able to manage it. Any message for aspiring actors? Life is more difficult for new actors nowadays because if you are not good no one will watch you. The competition is huge. The approach should be bookish and without knowledge you should not even enter. There should be more acting schools. Because satellite television is growing so fast that there is no time for trial and error. I had a lot of time - some 10 to 15 years - to reach where I am but for newcomers time is the most important factor. 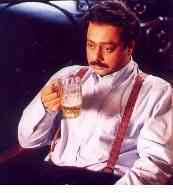 And finally... who is the real Sachin Khedekar? He is a 35-year-old Taurean. He constantly works on himself to have more magnetism. He lacks ambition but is extremely positive and optimistic so the whole thing around him works. And he tries to induce all kinds of positivity in his life. Except ambition he does not lack anything. He likes a lot of space around him. Is religious and that is his great strength. And has no clue as to what is 'in' and what 'out' and confesses that till date he has never seen a fashion show.